Looking for something new and exciting to teach your dog? 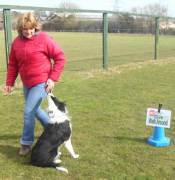 Rally Obedience, is the newest dog sport to arrive from the US. Dog and handlers navigate a course with signs indicating different exercises to perform. Our fun classes will introduce you to the sport of Rally, teaching you the basics of the exercises and how to navigate courses. It’s a fun way to learn and practice obedience with your dog. Anyone whose dog has basic training can take part. Due to the nature of the classes, they are not suitable for dogs with aggression problems towards people or other dogs. Venue: Knowl Hill Village Hall, 13 The Terrace, Knowl Hill, Reading, Berks, RG10 9XB. Do you want to introduce Rally-O at your club?